I purchased an 1849 quarter in November of 2006 that I was, at the time, unable to attribute using Briggs’ “Comprehensive Encyclopedia of United States Seated Quarters” (Lima, OH 1991 ISBN 1-880731-05-3). A short article by John McCloskey in The Gobrecht Journal (Issue 98, pages 35-36) published the following March described in detail a coin from the same die pairing as the coin in my possession. During the past two plus years I have examined every 1849 quarter that I could find, whether in auctions, at bourse tables, or on EBay (when photo quality permitted) in an effort to complete the puzzle. I now own four distinct business strike die marriages of the 1849 quarter and though there is not yet a definitive conclusion, I do have what I call a working hypothesis. I believe that the “unknown” obverse is actually obverse 3 in the Briggs Encyclopedia and that there are a couple of typos in the description that have caused some confusion. First, the date location of “just right of 5” is in error and should read “6/7”. Note that date position is determined based on an imaginary line drawn along the right side of the upright portion of the “1” in the date. The date position number then references where this line intersects the shield above with respect to the shield lines numbered from left to right. Second, instead of “slopes up left to right” it should read “slopes down left to right.” I’ve noted that the distance measurements from digit to rock provided in the book read 0.5 – 0.5 – 0.5 – 0.6 indicating a downward slope from left to right, though the text says “up”. 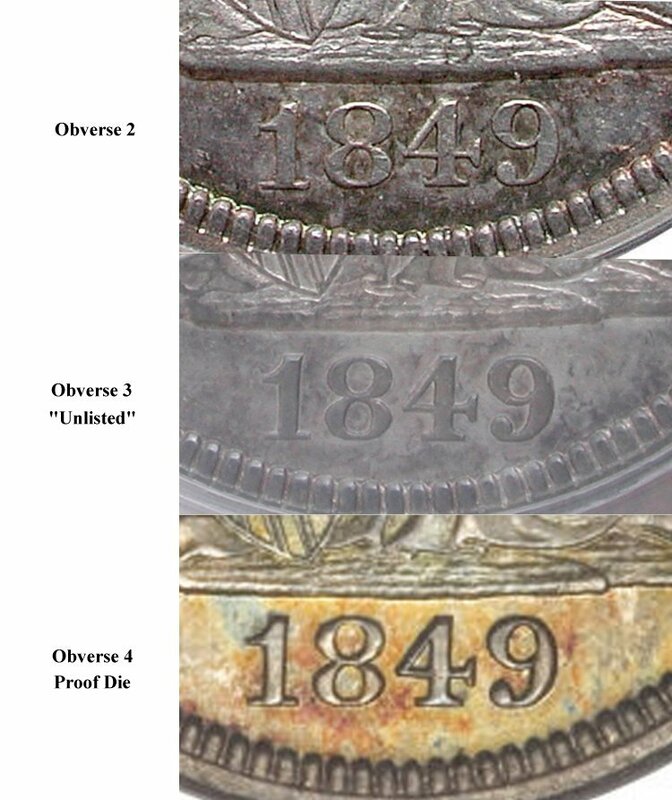 Figure 1 shows three dates of 1849 seated quarters, the top is obverse 2, the middle is obverse 3 (or the unlisted obverse if the hypothesis is proven wrong), and the bottom is the proof obverse (obverse 4, from the Heritage online archive, Lot 2390, Auction 1104, April 16, 2008). It should be mentioned here for completeness that obverse 1 has a date that is much further to the left than any of those shown. Please contact me by e-mail at greg.johnson56@verizon.net if you have or know of any 1849 quarters that meet these criteria or that have any other, unlisted date position.